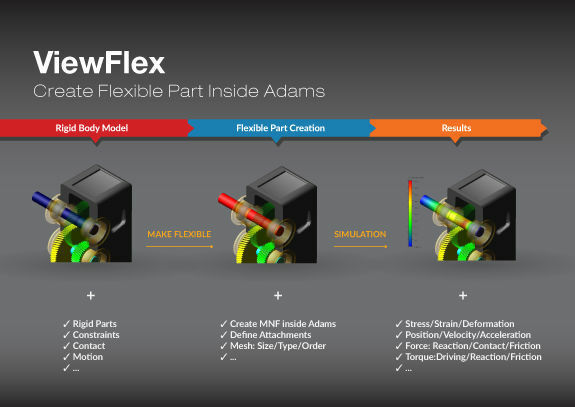 The ViewFlex module in Adams View enables users to transform a rigid part to an MNF-based flexible body within the Adams environment using embedded finite element analysis where a meshing step and linear modes analysis will be performed. It is powered by MSC Nastran, allowing one to create flexible bodies without leaving Adams View and without reliance on 3rd party Finite Element Analysis software. Also, it's a streamlined process with much higher efficiency than the way users have traditionally generated flexible bodies for Adams in the past.